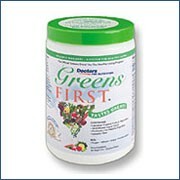 GREENS FIRSTAntioxidant Power of 10 Plus Serving of Fruits & Vegetables in Every Serving! Combine it with Dream Protein and Complete Essentials as the first Whole Food product in the Meal Replacement Kit! * No Wheat, Dairy, MSG, Artificial Sweeteners or Preservatives! 1. Put 8 ounces of water into the shaker cup. 2. Put 1 scoop of Greens First into the shaker cup of water. 3. Mix Well & Drink! Your body has just had the antioxidant equivalent of more than 10+ servings of fruits and vegetables. Only 30 calories and 3 grams of carbohydrates per serving. Each 9.4 gram scoop mixed with 6 to 8 oz. of water is proven to have the antioxidant power of 10 plus servings of fruit and vegetables.